This story starts in London: Garin “Bret” Asavaroengchai met the two sisters, Marian and Lucia Aguilar. Bret is Thai-American national brought up mainly in Bangkok, Thailand. Marian and Lucia come from Venezuela, the city of Varela in the Trujillo state in the Venezuelan Andes. Marian and Lucia arrived in London with both a Bachelor Degree’s of Logistics and Business Management in their pockets. at the same time they both worked for the Monmouth Coffee company. Marian and Lucia were brought up in the business of coffee, their father was an engineer but his passion made him buy a “Finca” a beautiful coffee bean farm named Santa Lucia, not far from Varela. with schools and work, Marian’s and Lucia’s parents always took all their children, four of them, to the farm. Their family used to produce a fine and delicate coffee bean. Today they still have the farm but unfortunately they don’t produce anymore, due to the political situation in Venezuela. Let’s start at the origin of coffee: Ceresia Coffee Roasters is the name of this lovely coffee shop in Bangkok, Sukhumvit area, and the name actually comes from the Latin origin of the coffee cherry. A coffee bean is actually a seed of the coffee plant, and is the source for coffee. It is the pit inside the red fruit often referred to as a cherry, and Ceresia is the Latin word for cherry. so they are soon celebrating their first year! It took them some time to realise that this was what they where going to do. In London Marian finally received her Master’s Degree’s in Business psychologies, and Bret during that time was a teacher and University lecturer. Let’s find regular jobs in the field of our Master’s Degree’s, here in Bangkok or we even had an idea about going to the USA. But the thing that kept them in Bangkok was the real desire of being here, finding Bangkok way to interesting to leave. And eventually they realised that the only thing they really wanted to do was to work in the field of coffee and roasting. It was not necessary anymore, to go around the subject, they needed to put their dreams and knowledge together. Searching for a location took them ages : they walked and walked until that day when they found the perfect spot. The landlord was impressed and welcomed the idea of a good coffee shop and specialised roasters in the neighbourhood! The two most common sources of coffee beans are: the highly regarded, Coffea Arabica and the Robusta of the hardier Coffea Canephora . The latter is resistant to the coffee leaf rust, but has a more bitter taste. Arabica on the contrary, to start with, is grown on higher levels, minimum 1200 m above sea level, the higher the better the bean will be, a much more difficult and delicate process, it grows a farther more well-balanced and smoother aroma and as well for the palate. Ceresia coffee beans. 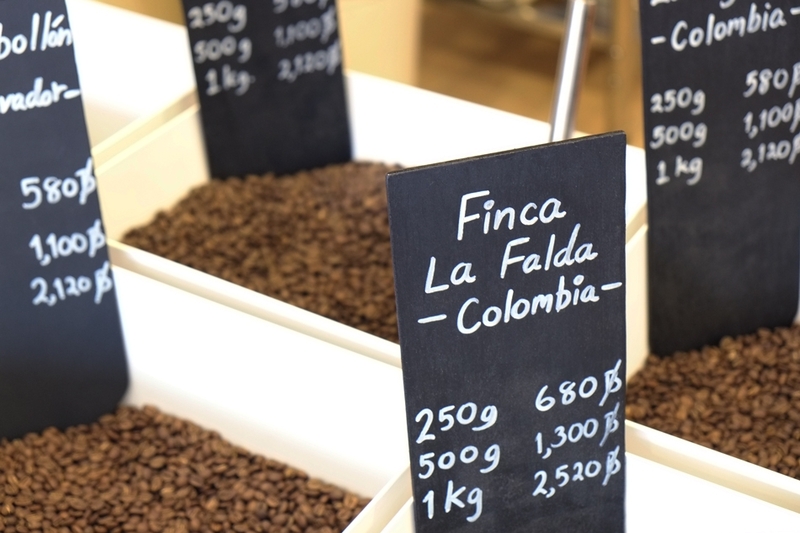 Finca la Falda from Colombia. To choose the farms is a long process and not to only trust your judgement but you will need very good recommendations. For South America and Central America, like, Colombia, El Salvador, Guatemala, Costa Rica and Brazil, Ceresia has an unvaluble help from Marian’s and Lucia’s brother, who lives in this part of the world, he takes care of the sourcing here, he will source only Arabica, he will research farms, locations, owner’s history, other’s recommendations, which process they use on the farm and the variety of the beans, just in Arabica you will find several varieties of the bean. They will soon start to source beans from Thailand as well, which also means that they will have the possibilities to go and meet farmers regularly. They also source from Kenya and here they rely on the recommendations of the farm, location, the owner and their reputation. Our future: We would like to continue searching and sourcing quality coffee beans to support coffee growers worldwide. In addition, we want to continue encouraging home brewing by offering freshly roasted coffee beans, by sharing our brewing method and our learning experience for the most enjoyable cup. We minimise waste, separate trash, use no water from plastic bottles, only filtered water, our “take away” mugs are biodegradable and we ride our bikes to work. When you enter Ceresia’s shop there’s a warmth and “welcomeness” which is exceptional, you can chat away with local and regular costumers over a lovely cup of coffee and the start of the day is perfect!